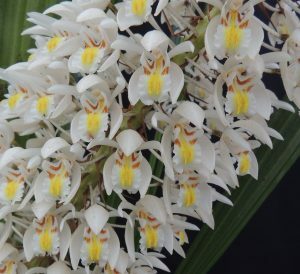 Coelogyne multiflora from the island of Sulawesi just east of Borneo is one of our large, warm growing Coelogynes. 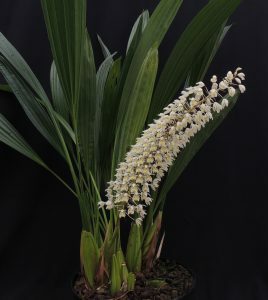 The broad leaves are 70cm long but conveniently upright and the dramatic flower spikes form from the centre of new growths in the early spring. I challenge student to count the flowers each time the species flowers and today’s skike has around 380 (we can’t all agree on an exact number) and it lives up to its name ‘Multiflora’. We grow the plant in Warm Asia with a minimum of 17C which will be similar to the natural habitat in lower montain forests at around 1200m altitude. It is reported as growing on fallen tree trunks and we grow it in a large pot where we keep it damp all year and well shaded from direct sun. Relatively few orchid species live on fallen dead trees but those that do appreciate additional feed to replicate the relatively nutrient rich environment they are evolved to suit. It is worth giving this species additional feed when in growth to build large bulbs that flower well the following year.